Valerie: We are calling upon Cosmic Sai Baba to make His presence among us and to give us a message this day. Thank you. 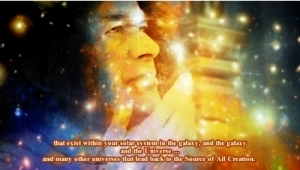 ❝I am Cosmic Sai Baba and I am very pleased to be here. And I am very pleased also to hear the conversations that have been taking place. If more people of like mind were to sit together – and think and share their way of thinking – more understanding would come. This is the way to Consensus because then differences can be respected and then resolved in some way. Even if they agree to disagree. Everybody should be respected – that is that simple. And there should never be a reason to raise a weapon to sort out a problem. This is something that is still happening upon the planet Earth and it is something that is not good – because nothing is gained from raising weapons. And I am sure that you would all agree with me here, in this room. There are many, many, many millions of people that would agree with this. They have demonstrated – around the World and unfortunately it is not always put on your media – so you are not aware of the numbers of people that do want Peace upon this Earth. Even the animals are changing. They are interacting unexpectedly with some that you would think would eat one another. But they don’t. Because they are touched by this new energy that is coming upon this Earth and it is happening – there is a gentleness that goes with it. But it is also a kind of Fire to get people moving as well. And if you become aware of what you really want and what you really know from another world and another Being that you are when you leave your Earth Body – then you will realise just how unnecessary it is to raise a weapon to sort out a problem. Now that I have said, there are many people – in other worlds – Other Beings not always looking like the same as the Humans on Earth – they have intelligence, and they are far advanced … when you compare it to your technology and they exist. I have spoken about ANDROMEDA and it is your next galaxy. And I have linked it with the colour MAGENTA. This is like a door – this is an energy and a vibration of a colour that does not exist in your rainbow. BUT it is a way of focusing and becoming aware of an intelligence and a dimension that exists in Andromeda. The Beings are more Androgynous and I would like you to think about that. I would like you to know – and I have said this before – that the knowledge that exists upon this planet (Earth) has come from elsewhere – it did not begin here upon your planet. Everything upon your planet has come from somewhere else. And it comes with teachings and a good deal of it has come from Andromeda. I would like you to think about that. The early teachings of religion have come from Andromeda. This is the Ancient Ones. And then further knowledge was given – and then of course, unfortunately, it has (caused) separateness in people who are here upon this earth planet who have seen it (their teachings) as separate and different and the only one. This is a big mistake, of course. For, it (the teachings) have come from the Source of All Creation – THERE IS NO SEPARATION. And there is a race that is advanced from the Human Body that you are; and that exists in Andromeda. So this is an ANNOUNCEMENT that the Beings that would like to come from ANDROMEDA and make themselves known are very similar TO YOU in the way they look – and that would perhaps make it easier for the human race to accept us. To accept the Beings from other Worlds. Not looking so very different – but rather an advanced state of consciousness and culture and living and knowing and – shall we say – wiser. I have said enough for today but I do hope that you will do some more research into ANDROMEDA and that you will be more aware that it is coming from us at this time with influence of the Magenta colour. And we hope everyone upon this Earth is responsive to that. For there is nothing for you to be afraid of at all. We come only to assist. We come only with Universal Love and Universal Light and Universal Holy Spirit. Thank you my children. Thank you. You may wish to watch a video about a Magenta activation which was featured in Valerie’s Newsletter of January 2017.